Ernie Suwara started his VB career as an East Coast player out of New York that came to Southern California to train with the best players. He attended Santa Monica College to play for HOF coach Burt DeGroot. He was a starter for the 1964 USVBA champion Hollywood Stars as part of what was the first USA Olympic Trials and his success there propelled him to be the youngest player on the first USA Olympic Team in 1964. He was a starter in Tokyo at the age of 19. He was the Most Valuable Player on the 1964 squad where his brother Rudy was an Olympic alternate. He then transferred from SMC to UCLA where he started for the Bruins on USVBA National Title teams in 1965 where he played with Larry Rundle (brother Rudy was an assistant coach and 2017 SCIVBHOF honoree Al Scates was head coach) and in 1967. 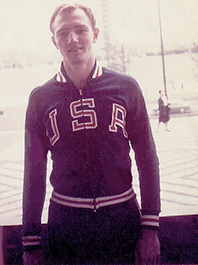 Four times he garnered USVBA All-American honors. Selected for UCLA Athletic Hall of Fame in 1989, Ernie was one of only a couple of players selected from the pre-NCAA era for the Pac-12 All-Century Team. He was also an outstanding beach player, winning three tournaments (two with Mike Bright) and being voted into the California Beach HOF. He worked for Dean Witter and Kansas City Board of Trade after retiring from volleyball. He is now back living in Southern California.